Some people would call this an image ad, but we believe it's not even that, since "we have them" is really the only message, and the name is really meaningless to everyone except those already familiar with the place. If you or your ad staff is writing off small, upscale places like this as only appropriate for low-revenue "top of mind awareness" campaigns, you're missing out on some major revenue and most likely hurting your advertisers, too (see Test: Is your local ad staff killing your newspapers...). When this account dropped out due to lack of response, Whitefish Pilot (MT) ad rep Brad Biuleu knew just what to do. He used our Response Oriented Selling techniques to help accurately categorize this former advertiser as a high-potential account and proceeded to interview them, create a presentation, and then sell them a new, larger, more frequent, and more effective strategy. He knew that with their average sale of $2,500 they could sustain this ad each week (even with a bad response). And with a relatively limited market out there for fine handmade furniture (especially in this economy), he knew that the ad needed to be substantial to ensure enough people saw the ad so enough of them actually bought. The new 7 x 15 inch strategy is dramatically more effective, grabbing the attention of the right reader, getting them to read on, and giving enough detail for people to make a decision to come in. It's the best thing you can do for a prospect and selling it is easy with the right approach (see the main body of the blog for more on that). 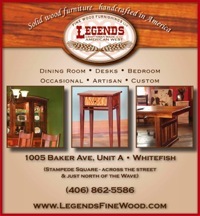 The strategy was simple--grab the attention of people who are in the market for artisan furniture with a clearly beautiful handmade piece of furniture. This sunburst bed was the perfect choice. The trick was then to communicate what people wanted in the headline--unique, handmade, and locally created. We then rounded out the concept in the sub-headline. From that point on is was pretty easy. With the help of a rough sketch, created in our one-on-one target account sessions, Brad instructed our DesignYourAd overnight production team to create the new ad at the much larger size of 7 x 15 inches. After drawing the new approach to direct response advertising out of the prospect (instead of just telling them what to do, which rarely works given its subjective nature), Brad went over the strategy and got them off and running with the new size, frequency, and ad strategy. It's this, of course, that ends up enabling the account--before they run--to see the new ad is not a risk at all, and safe to throw some serious money at. It's this process that's the most direct path to eliminating those pesky objections like "I have no money", "it's a recession", "you're too expensive" and virtually any other one that comes up. Better yet, you're helping the advertiser succeed both in the short and the long term. After all, if they don't succeed, the newspaper doesn't succeed. That's why we believe (and proven out by our clients as other posts in this blog show) that this is the fastest route to major revenue increases, and it actually has an immediate, significant impact on the business community. So, don't let your advertisers pressure you into believing that small, frequent ads are the best path to success, even if it's what they desperately want to hear. With the right ad strategy, large and more frequent ads are many times the safer (and far more profitable) bet for all involved.